All I wanted was to be left to farm. To till the soil and grow enough beans and barley to feed myself through the winter. But the valley was growing dry, dust rising from the tread of our oxen. With each passing week, we had to walk further to fetch water for the plants. With each passing year, our bellies went more empty. My neighbour had married a woman from another tribe. She told us about the qanat in their valley – a tunnel that drew water out of the hill into the fields. This was the marvel we needed, but digging it was the art of a specialist, a man called a muqanni. All of us drew lots, and I lost. Reluctantly leaving my fields in the hands of others, I set off to find a muqanni. When I returned my crops looked weak. But I had the muqanni , a cranky, white bearded man whose tools I had carried all the way from the Euphrates. Now I could return to my work. “You will help,” he told me after meeting my neighbours. “You are the youngest of us,” one of my neighbours said. “The most resilient,” said a third. The first morning we walked the sides of the valley while the muqanni decided where to dig. As he prodded the grounded and peered at the rocks, I took the time to enjoy views. It pleasant, but it was not helping my farm. Have you ever spent weeks on end digging holes? I thought not. Let me tell you, there is no joy in it. Your hands become raw and blistered. Digging downwards, you descend into darkness, losing the warmth of sunlight. Soon your world is just dirt and aches. I have never felt so relieved as when the dirt grew damp beneath my feet, and I knew that we had hit the water level. “It’s done!” I reached the top of the hole and threw my spade down in front of the muqanni. Until then I had tried to tend my crops as well as dig, using the dusk hour to look after my farm. But now I saw how much more work there was to do, I surrendered. 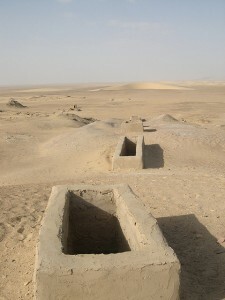 If I wanted an end to the digging and the deep, dark holes, I must throw my whole self into making the qanat. For weeks I dug. The muqanni showed me how to dig each ventilation hole to the right depth, using a measuring stick and a knotted rope. He dealt with the dirt that came out, and with shoring up the holes. At the bottom of the slope we marked out the canal which would carry the water to the fields – my neighbours could at least dig that part – and then began the water channel, heading back into the hill. I was amazed to see the results of the muqanni’s skill. With his guidance, the tunnel easily hit the bottom of each hole I had dug. Day by day, my lanterns and I headed deeper into the hillside. But water was life. Water was the gift we sought. And so I paid no attention, but kept driving forward as hard and fast as I could. When I saw water seeping through the dirt ahead of me, I did not hesitate. Instead I cheered and plunged my spade into the soil. The earth burst open, water gushing behind it. I staggered back, plunged into darkness as my lamps were washed away. I was thrown from my feet, choking and struggling to reach the air. Even as I burst gasping to the surface, a fresh torrent swept me away again. Water filled the tunnel. There was no more air for me to reach up into. I would be dead before I ever reached the end of the tunnel. I burst up into the next hole, and grabbed the side before I could be swept away again. With slow, aching movements I gripped protrusions in the side of the hole, and started dragging myself toward daylight. At last I crawled out into fresh air. In the valley below, my neighbours were cheering and waving as water flowed into their dusty fields. Exhausted and half drowned as I was, I felt huge satisfaction at the sight. The muqanni stood looking down at me. That is how I became a muqanni. So next time you tell me that I work you too hard, or that my lessons make no sense, remember this – my apprenticeship was ten times worse than yours. If you enjoyed this story then you might also like my collection of historical stories, From a Foreign Shore, only 99c on Amazon Kindle. Like last week’s story, this was inspired by reading Donald Hill’s A History of Engineering in Classical and Medieval Times. It turns out that people came up with some amazing ways of watering their crops in the ancient world. Great flash, Andrew. I could feel the heat and dryness, and then the relief and terror of the newly sprung well. Fantastic! Thanks Alex – it’s always nice to know someone enjoyed a story, as I’m sure you’ve experienced. I love stretching my imagination on these little stories. Next Next post: Should We Write The World We See Or The World We Want?